In the history of cholera, seven cholera pandemics occurred during the nineteenth and twentieth centuries and five of these affected the American continent. Ships transporting European immigrants in the nineteenth century probably brought the disease to the American continent during the second pandemic. Between 1973 and 1991, infrequent indigenous cholera cases were reported in different parts of the USA including Louisiana, Florida, Georgia, Maryland, which have been linked to the Gulf Coast reservoir. In 1991, cholera resurfaced in Latin America accounting for 66% (396,536 cases) of all cholera cases reported worldwide that year. Unexpectedly, cholera re-emerged in Peru during early 1991 and quickly turned into an epidemic that extended to Bolivia, Brazil, Chile, Colombia, Ecuador, El Salvador, Guatemala, Honduras, Panama, Venezuela, and Mexico. During this time, several important environmental factors including El Niño were attributed to the increased incidence of cholera. During and after the cholera outbreaks in South America, intensive measures were taken that include epidemiological surveillance, setting up of a laboratory network, proper patient care, improvements in basic sanitation, and clean water supply systems. Such timely measures helped to control cholera and other diarrheal diseases. Several molecular techniques have allowed the study of clonal variations in Vibrio cholerae for the first time. 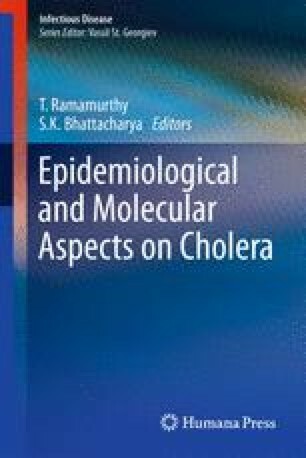 Molecular tools helped in identifying the epidemiological links with import of cholera by travelers as well as of the environmental origin. Several serotypes of V. cholerae exist in costal environments and seroconversion may play an important role in the epidemiology of cholera. The research was supported by grants from the Consejo Nacional de Ciencia y Tecnología de México (project 2397 PB) and the UNAM Dirección General de Apoyo al Personal Académico (project IN211496).